Human mobility is an important driver of geographic spread of infectious pathogens. Detailed information about human movements during outbreaks is, however, difficult to obtain and may not be available during future epidemics. 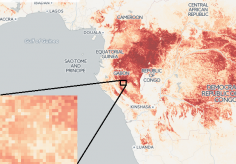 The Ebola virus disease (EVD) outbreak in West Africa between 2014–16 demonstrated how quickly pathogens can spread to large urban centers following one cross-species transmission event. Here we describe a flexible transmission model to test the utility of generalized human movement models in estimating EVD cases and spatial spread over the course of the outbreak. A transmission model that includes a general model of human mobility significantly improves prediction of EVD’s incidence compared to models without this component. Human movement plays an important role not only to ignite the epidemic in locations previously disease-free, but over the course of the entire epidemic. We also demonstrate important differences between countries in population mixing and the improved prediction attributable to movement metrics. Given their relative rareness, locally derived mobility data are unlikely to exist in advance of future epidemics or pandemics. Our findings show that transmission patterns derived from general human movement models can improve forecasts of spatiotemporal transmission patterns in places where local mobility data is unavailable.